Ipswich Town manager Mick McCarthy does not believe the departure of club chief executive Simon Clegg will impact on his work at Portman Road. "Whoever runs the club runs the club, I'll work with someone else," the Town boss told BBC Radio Suffolk. "I don't understand the machinations on the administration side of it, people come and go like managers do." 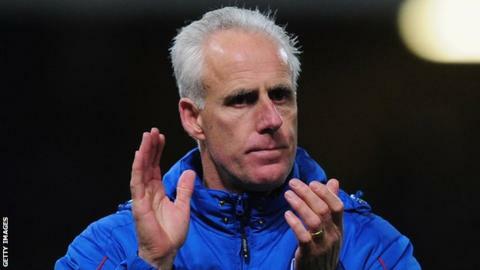 Clegg and Ipswich have parted company after four years, during which the club has struggled in the Championship. McCarthy also played down the recent controversy caused by striker Michael Chopra, who posted a picture of a large bagful of £20 notes on Twitter. "I don't understand why people go on Twitter, I just don't," said the Yorkshireman. "And why you would get involved in an argument on it, with someone you don't know, is beyond me." But McCarthy, who missed last Saturday's 4-0 thrashing of promotion-chasing Middlesbrough because he had influenza, said he was "delighted" with the business done by Town during the transfer window. The Suffolk club extended the loan deal for defender Patrick Kisnorbo from Leeds, brought in defender Richard Stearman on loan from Wolves, and re-signed West Ham keeper Stephen Henderson on loan until the end of the season. McCarthy also brought in two forwards on loan - David McGoldrick from Nottingham Forest and Aaron McLean from Hull City - while another striker, Frank Nouble, was signed from Wolves for an undisclosed fee on an 18 month contract.